א I will extol You, O God my King, and I will bless Your Name forever and ever. ב Every day will I bless You, and I will praise Your name forever and ever. ג Great is Adonai and highly to be praised; God’s greatness is beyond our understanding. ד One generation lauds Your deeds to another, and tells of Your mighty acts. ה I will tell of the glorious majesty of Your splendor and of Your wondrous deeds. ו They will speak of Your awesome power, and I will recount Your greatness. ז They will utter a recollection of Your abundant goodness, and will sing joyously of Your righteousness. ח Adonai is gracious and compassionate, slow to anger and full of kindness. ט Adonai is good to all, and God’s tender mercies are upon all of God’s works. י All Your works will thank You, Adonai, and Your faithful ones will bless You. כ They will speak of the glory of Your kingdom, and will tell of Your power. ל To inform all human beings of God’s mighty acts, and the majestic glory of Your dominion. מ Your kingdom will last forever, and You will rule in every generation. ס Adonai supports all those who stumble, and straightens all those who are bent. ע The eyes of all look to You in hope, and You give them their food in due season. פ You open Your hand and feed every living creature until it is satisfied. צ Adonai is righteous in every way, and faithful in every deed. ק Adonai is near to all those who call, to all who call upon God sincerely. ר God will fulfill the wishes of the reverent; God will hear their cry and deliver them. ש Adonai protects all those who love God, but will destroy all the wicked. ת May my mouth utter the praise of Adonai, and may all flesh bless God’s name forever and ever. One of the best known of the Psalms, ashrei is recited three times every weekday (once at the morning service, once at the afternoon service, and once in personal prayer) and a fourth time on Shabbat (during the Torah-reading service). It takes the form of an alphabetical acrostic… as if to say “Let every single letter of the alphabet find a way to praise the Eternal One!” The ashrei is the earliest such example of the alphabetical acrostic in prayer; hundreds of medieval piyyutim (poem-prayers) later followed its example. 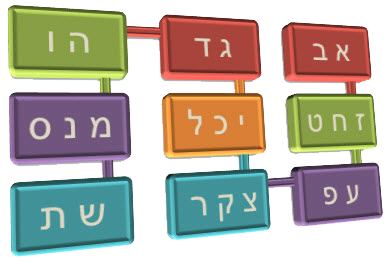 The only letter missing from the acrostic is נ. Legend has it that the Psalmist omitted that letter because it begins the root n f l נפל “to fall,” and its use would therefore remind the worshiper of the “falling” of the two Temples in Jerusalem and the subsequent exiles of the Jewish people.